There are three examples of these candlesticks sitting in the showcases at Cambridge Museum. Two are clear crystal glass, as they are listed and advertised in several editions of the Butler Brothers Wholesale Catalogs from 1906-1922. One is in amber glass. Interestingly, we found no examples of any kind: crystal or iridized, on display in the Imperial Museum! Obviously, this 9 ½” - 9 ¾” candlestick was an exceptionally good seller. However, to locate even a single example in marigold today, is akin to seeking pure gold! Anyone having a single or a pair in marigold carnival glass should be congratulated for their acute sense of “worthy pursuit” of the evasive element! Mid-year of 2000, I received a telephone call from a lady seeking advice on a piece of Carnival Glass given to her by a daughter, who had found it in a charity shop in far Western Australia. It was a Crucifix Candlestick in marigold. The lady had been told that it was quite valuable. After some discussion had taken place, I came to the conclusion that she had received advice from others as to the authenticity of it. She went on to say that as she was not of the faith, she felt that it was out of place sitting on her mantle piece. She was offering it to me, for sale, if I was interested in making her an offer. I made what I believed to be a fair offer and she came back with, “Is that the best you can do?” “Oh”, I said. She then stated that she was looking for cash money. I made the offer higher and this was accepted on my conditions; those being that my friends, who lived in the same area as she, could arrange to check it as to its condition and color, pay the money and collect the piece on my behalf. A time was arranged between my friends and the lady. All was satisfactory, and in due course, I became the owner of one very nice piece of Carnival Glass. This exchange took place over three hundred miles from my place of residence. Note: Margaret indicates that the outside measurement of the candlestick base is 4”. The glass is ¼” thick. 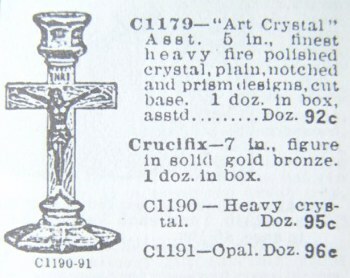 Her information also includes the fact that a collector friend living in Perth, owns a pair of these valuable Crucifix. On a personal note: Margaret and Ron Dickinson have been actively associated with the A.C.E. (Australian Carnival Enthusiasts) Club since its inception. That Club celebrates its 29th Birthday in 2004. Devotion to task is the basis of success in promoting Carnival Glass collecting the world over. It never seems to matter what one does for a living, nor where any of us are from geographically. The commonality of sharing the glorious Glass creates lasting friendships. The idea is to work together for the “tomorrows” of Carnival Glass Collecting! In conclusion: The illustrations of the various and individual ads which appear in wholesale and factory catalogs indicate differences, to the extent that we might venture an educated guess that Imperial was the only company which provided marigold examples. Extremely rare as they are, we might venture to believe that perhaps only one “turn” (approx. 400) was produced; or possibly only a “half turn”? 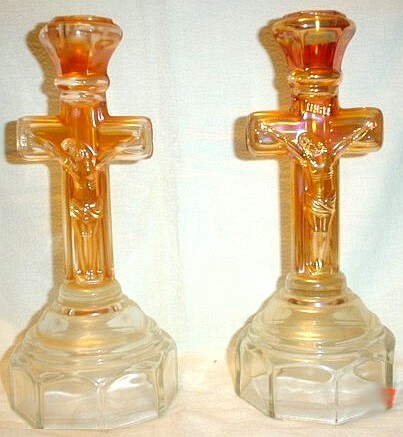 Without question, these can be termed the rarest of all carnival glass candlesticks! 1. 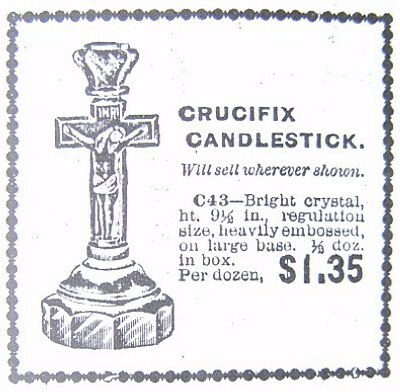 The ad shown in the Cambridge Catalog indicates their version was provided only in crystal. 2. The ad taken from The Complete Book of McKee Glass indicates their production to have been in crystal, as well. 3. Offerings of Opal and “solid gold bronze” are seen in two other ads. We have no clue as to manufacturer. Referenced in the above July 1914 Butler Bros. Ad. 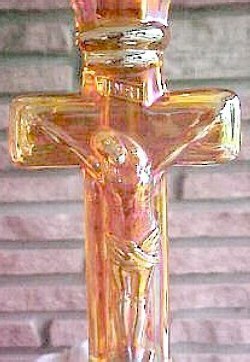 7 inch crucifix with figure in solid gold bronze. Many thanks to Svetlana Campbell for the update below! 4. Yet another question must be raised when the matter of Crucifix Candlesticks arises. Unless and until someone has proof to the contrary, we must assume that since the ad from that 1909 Imperial Catalog displays the exact same base in crystal as that found on the base of the marigold examples shown here; Imperial was apparently the only producer of the very rare marigold examples. Since there was (is) a mold displaying the head of Christ turned in both right and left position, we are left to wonder whether these were intended to be the determining factor for use as a PAIR? Were they originally marketed as pairs? The three steps leading up to this Latin cross represent the hill of Calvary or, more often, faith, hope and love. 1Cor. 13:13 - And now these three remain: faith, hope and love. But the greatest of these is love. 1906 Butler Bros. Catalog. 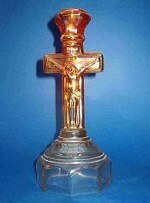 Note the similarities to the known Imperial Crucifix. Spring 1908 Butler Bros. Catalog-7 in. tall. 5. 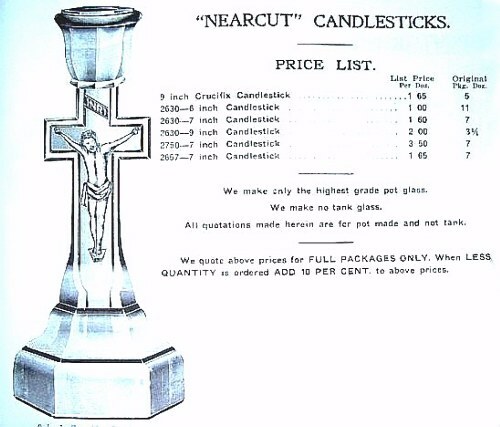 As you can see from the ads of varying manufacturers, sizes range from 5” to 10” in height, depending upon the type of Crucifix offered. 6. 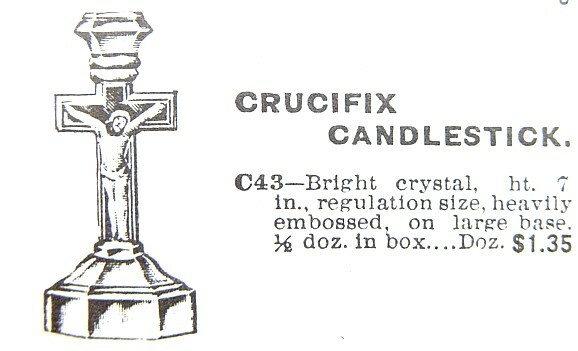 The two photos of a marigold Crucifix taken against a brick backdrop is from another source, and confirms another example from Imperial production, as verified in the 1909 Imperial Catalog marketing ad. This example is said to measure 9 ¼” tall. 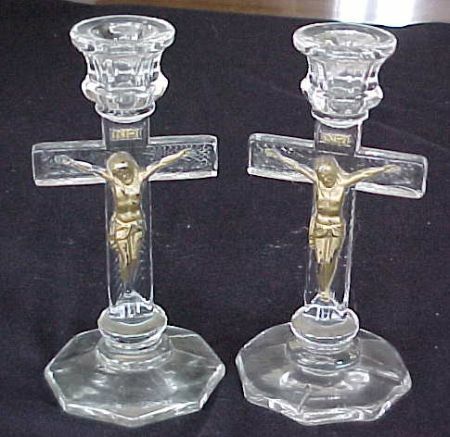 The photo of the pair of Crucifix owned by Leila Galvin of Australia clearly illustrates the differences in molds. 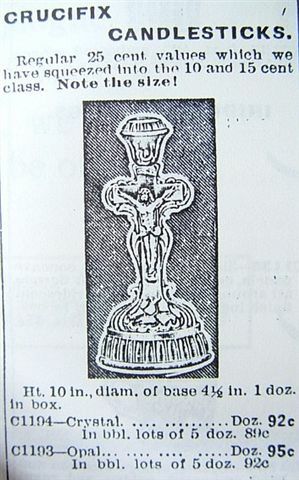 While the candle cups and bases appear to be of the same design, the absence of INRI on the example shown at viewing left, as well as the subtle alteration of the folds in the loin cloth and tilt of the head, along with a seeming fraction of difference in overall height suggest that perhaps if these were marketed in pairs, one is intended to have a ¼” variance in height noted between actual measurement of some examples and that given in catalog ads, lending unanswered questions. Further contemplation surrounding the differences in the molds, along with reference to Luke 23-under the heading: THIS IS THE KING OF THE JEWS: vs. 39-43, we conclude that the mold maker took into account the fact that only ONE of the criminals on two accompanying crosses with Jesus, asked to be remembered. The other rebuked Him! Therefore, we feel that only the Crucifix having the INRI identification is a likeness of Jesus. The pair is complete with the other cross being a simple, unmarked one, indicating the man who asked to be Saved. We are led to believe this pair signifies the two who met again in Paradise. We can appreciate the photo opportunity for making this comparison study. Thanks to the efforts extended by our Continental friendships and the tremendous advantages afforded by internet transfer of updated material, we have all become better informed! Additional NOTE: An interesting, but brief account of the reasons Christians wear a Cross for jewelry, as a symbol of their beliefs, appeared in a recent monthly bulletin from RBC Ministries, based in Michigan: “Can you imagine what public reaction would be if a fundamentalist religious group adopted an electric chair as its symbol? Wearing such as that around your neck as a piece of jewelry would certainly stir controversy. Yet, that’s what the cross amounts to. The cross was a means of capital punishment. Crucifixtion was the way the Romans put their worst criminals to death. It was horrible---far worse than a gas chamber, firing squad, or even a hangman’s noose. There is but one true God ! God Almighty!...Creator of Heaven and Earth and all mankind! THE God of Love and LIFE ETERNAL! Click on the crucifix to see an AWESOME video!